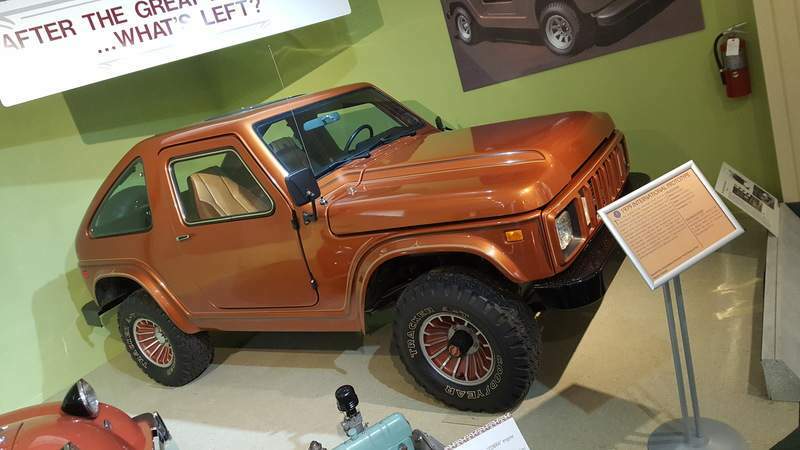 Ryan DuVall | The Journal Gazette The fiberglass composite SSV Scout concept truck is on display at the Auburn Cord Duesenberg Automobile Museum in Auburn. 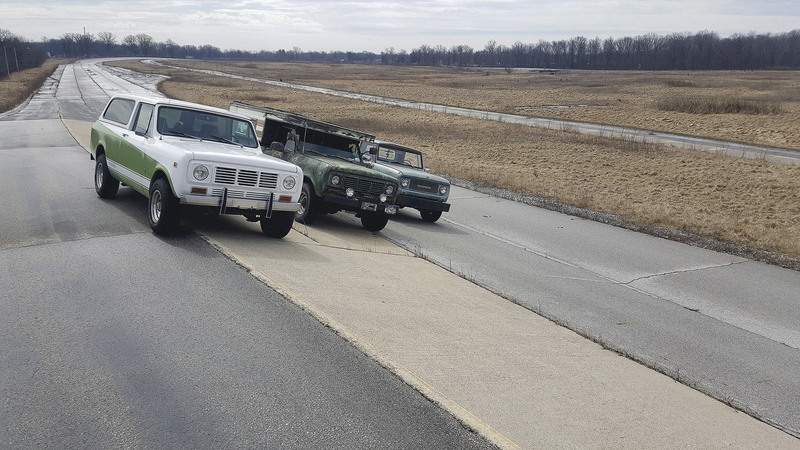 Ryan DuVall | The Journal Gazette From left, a 1976 International Harvester Scout, a 1976 Scout II with an IH pop-up camper top and a 1968 Scout 800 sit on the proving grounds test track along Oxford Street. The track will be open to private Harvester truck owners for the first time Aug. 10 during the Harvester Homecoming, which includes a truck show and Harvester employee celebration. 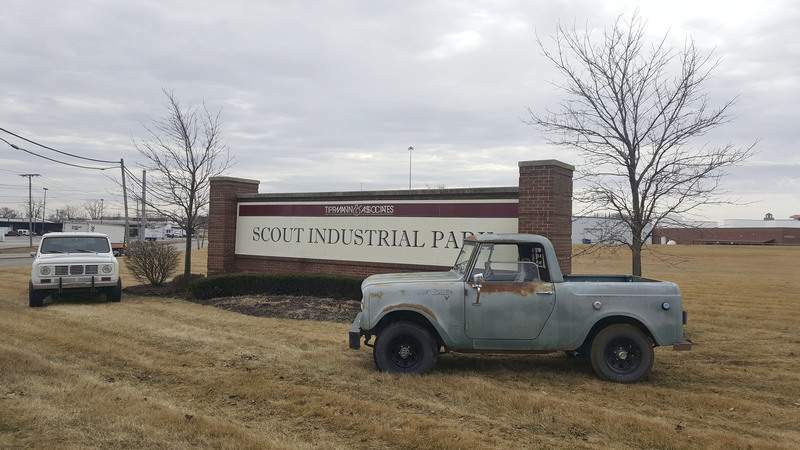 Ryan DuVall | The Journal Gazette A pair of Scouts, a 1976 Traveler on the left and a 1968 800, in front of the the Scout Industrial Park sign, site of the Scout factory, at Meyer Road and New Haven Avenue. An all-Harvester truck show and celebration of the former Harvester workers will be held here on August 10 with hopes of raising funds for a charity dedicated to Harvester's history in Fort Wayne. Where: Scout Park Conference Center, 2300 Meyer Road; proving grounds test track/course, 4300 Oxford St. Cost: Free to public with donations requested. Truck entries require $30 donation with additional $20 for proving grounds access. Tickets for truck entries are being sold through eventbrite.com. What DuVall didn't realize was the story would lead to the formation of a group planning a Harvester Homecoming on Aug. 10 at the Scout Park Conference Center – the building where the Scout vehicles were built – and the former Harvester proving grounds. The event will feature an all-Harvester truck show outside the conference center at 2300 Meyer Road. Enthusiasts can bring any International Harvester vehicle to the show, and the proving grounds – a 1.18-mile track on Oxford Street – will be open for people to see or drive their Harvester vehicles on – given some speed constraints. Don Cates, president and CEO of Three Rivers Federal Credit Union, an early sponsor of the event, said momentum started with DuVall's story. “This has been an emotional roller coaster for me,” DuVall said last week. DuVall's father recently bought him a 1976 Scout Traveler. DuVall said he came up with the idea for a Harvester Homecoming after a call from History Center Executive Director Todd Pelfrey the day after the story was published in the newspaper. DuVall said he had lunch in early January with Mayor Tom Henry, who gave him some contacts, including Henry's brother Jerry. Coonrod worked at Fort Wayne's International Harvester plant from 1969 to 1980, with most of that time spent in the Scout plant. Bean's stepfather owned a 1937 Harvester ton-and-a-half truck. “When I was 10 or 11, I spent my summer nights laying on top of the cab looking at the stars,” he said. Cates isn't from Fort Wayne but said he's surprised the area doesn't already have an event like the Harvester Homecoming.